On the ABC of the Classical Dutch, IM Andrew Martin gives the student a thorough grounding in the ways of this unconventional opening. The positions that are reached after 1...f5 are always sharp and unclear, suiting the chessboard warrior very well. You cannot play the Dutch with a faint heart! 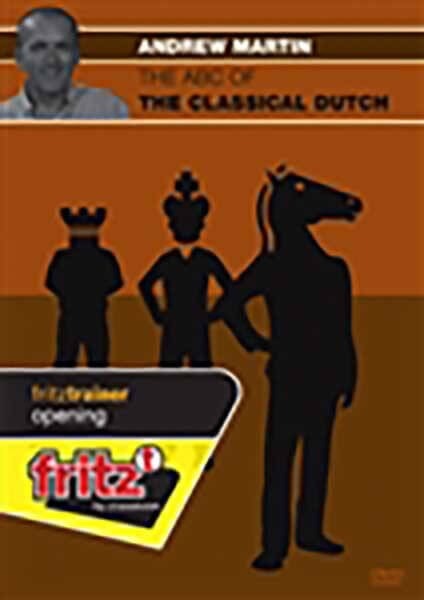 The ABC of the Classical Dutch will analyse systems where predominantly Black plays with an early ...d7-d6. There are discussions of all the key ideas and opening themes, as well as repertoire suggestions for Black. The Classical Dutch does not enjoy an especially good reputation at the highest level, but from time to time the great players have employed 1...f5 when fighting outright for the win. It would not have been a good idea to tell Alekhine, Botvinnik, Bronstein or Larsen that 1...f5 is a weak move! The world of the Classical Dutch is a rather unusual one. If you are looking for a winning weapon as Black and you are an uncompromising fighter, then this opening is for you! IM Andrew Martin is 54 years old and holds the FIDE Senior Trainer title. Since 2004 he has recorded over 25 DVD's for ChessBase.